Invest Openly: What Causes My Blog Traffics To Jump More Than 450% Yesterday? What Causes My Blog Traffics To Jump More Than 450% Yesterday? This morning, I woke up with wide-upon eyes when I saw the traffics (Pageviews) of my blog jumped from the usual 600 to 700 pageviews (per day) to an astonishing 3,160 pageviews yesterday. It is more than 450% jump! It means something "fishy" if this is on a stock counter, but not this case. I remembered a few days ago, I started to share my blog posts in a discovery engine called StumbleUpon (a discovery engine that recommend web content to its users basing on their indicated interests), upon further checking, it is confirmed that the source of the surge is mainly from StumbleUpon. In short, selected posts of mine went "viral" momentarily within the site and hence more users are seeing my posts. Most of the users are from USA, which means they might not be able to appreciate the stocks that I am covering in my blogs but it doesn't harm to have more viewership from international readers too. So, if you are looking for more exposure/traffics of your blog, you may want to consider give StumbleUpon a try. P/S: For targeted traffics (i.e. local retail investors for my case), The Finance Sg is still the key. 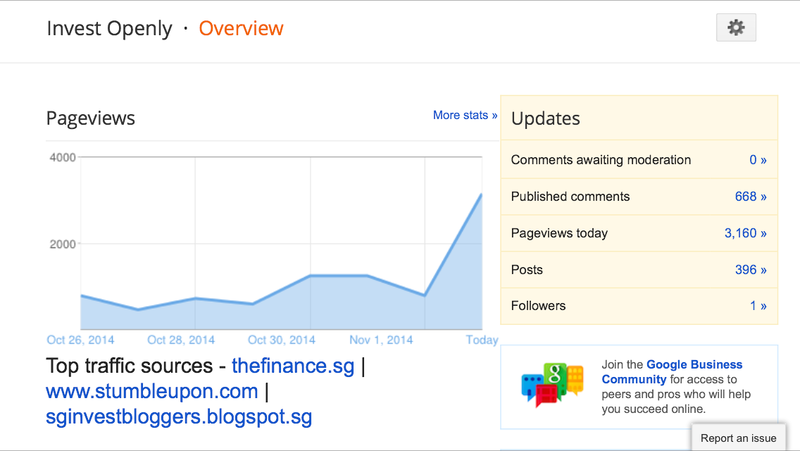 By the way, The Finance Sg has just revamped their site to a sleeker and cleaner UI. Do check it out.